Don’t settle for the weak sounding exhaust system that comes stock on your Harley bagger. 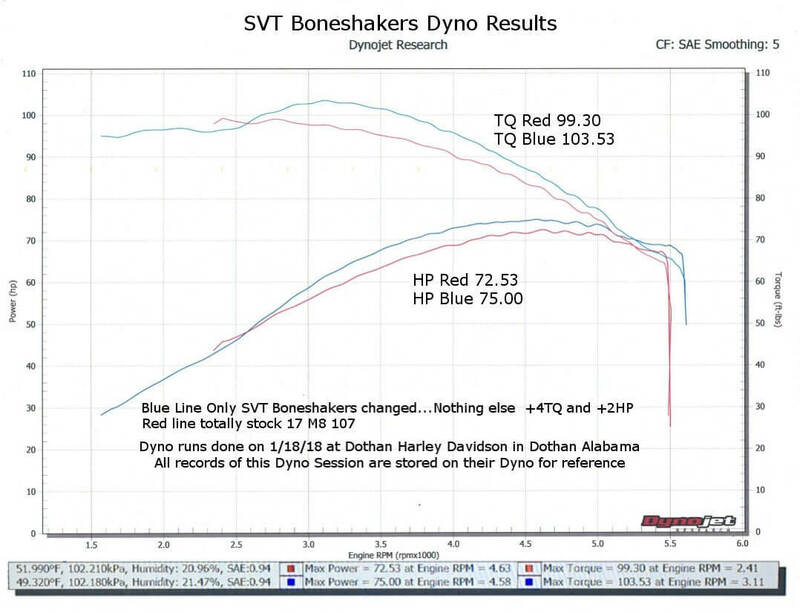 SVT Boneshakers are the best on the market for giving your Harley the high-powered growl you love. These SVT Boneshakers Harley Davidson slip on mufflers are made specifically to fit Harley Davidson Touring Models 2017 and up. Boneshakers are sturdy aftermarket parts for Harley Davidson, engineered to offer a loud, deep sound at idle, and a smooth, mild tone at cruising speed — thanks to an all steel Cyclone Baffle System. These slip ons come in brilliant chrome, with four-inch black tips proudly featuring the SVT Boneshaker logo. One of the easiest upgrades you can make to your bike is finding the right Harley Davidson mufflers. Boneshaker slip on mufflers give your bike a pronounced growl when idling, and a consistent, milder tone at cruising speeds for a pleasant ride. These custom aftermarket parts for your Harley Davidson emphasize the sound Harley Davidson is known for. Adding Boneshaker slip on mufflers is a premium upgrade for your Harley Davidson Touring Model. You have to hear the difference to believe it. Call us today with questions or order requests at 800-520-8525. We’re happy to help you find the parts you need for a perfect fitment, guaranteed. Order Harley parts and accessories from West End Motorsports!